Eosinophilic fasciitis (EF), a rare connective tissue disorder, was first reported by Lawrence Shulman in 1974. Since then over 300 cases have been reported worldwide. EF has variable clinical presentations and currently does not have internationally accepted diagnostic criteria. Dermatological features are the most ubiquitously present symptoms. It often presents with sclerodermalike skin changes. Extracutaneous presentations, such as arthritis and carpal tunnel syndrome can precede cutaneous changes. The most useful clinical features are the lack of Raynaud’s phenomenon, telangiectasia and visceral involvement, differentiating it from Scleroderma. Haematological disorders, solid tumours and autoimmune disorders are frequently associated with EF. Historically, the presence of peripheral eosinophilia, elevated ESR and hypergammaglobulinemia were considered to be diagnostic of EF. It is now well recognised that neither the presence of eosinophilia in the blood nor eosinophilic infiltartion in the fascia is necessary for its diagnosis. An en bloc surgical biopsy including skin, subcutis, fascia and muscle is the gold-standard test for diagnosing EF. Magnetic resonance imaging helps to locate a suitable biopsy site and to monitor treatment response. Although its underlying aetiology is unknown, there is a growing body of evidence supporting an immunological origin. Immunosuppressive drugs are used to treat EF and the corticosteroid is the first line treatment. A significant proportion of patients can develop permanent disabilities such as joint contractures, tendon retraction and subdermal sclerosis. Occasionally it can be treatment refractory or have a relapse-remitting course. We report another case of EF with a literature review. 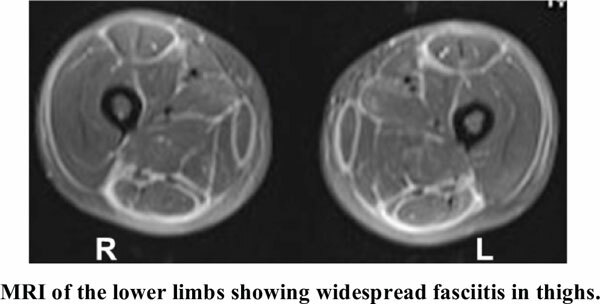 Keywords: Eosinophilic fasciitis, eosinophilia, scleroderma, ubiquitously, scleroderma, haematological. Keywords:Eosinophilic fasciitis, eosinophilia, scleroderma, ubiquitously, scleroderma, haematological. Abstract:Eosinophilic fasciitis (EF), a rare connective tissue disorder, was first reported by Lawrence Shulman in 1974. Since then over 300 cases have been reported worldwide. EF has variable clinical presentations and currently does not have internationally accepted diagnostic criteria. Dermatological features are the most ubiquitously present symptoms. It often presents with sclerodermalike skin changes. Extracutaneous presentations, such as arthritis and carpal tunnel syndrome can precede cutaneous changes. The most useful clinical features are the lack of Raynaud’s phenomenon, telangiectasia and visceral involvement, differentiating it from Scleroderma. Haematological disorders, solid tumours and autoimmune disorders are frequently associated with EF. Historically, the presence of peripheral eosinophilia, elevated ESR and hypergammaglobulinemia were considered to be diagnostic of EF. It is now well recognised that neither the presence of eosinophilia in the blood nor eosinophilic infiltartion in the fascia is necessary for its diagnosis. An en bloc surgical biopsy including skin, subcutis, fascia and muscle is the gold-standard test for diagnosing EF. Magnetic resonance imaging helps to locate a suitable biopsy site and to monitor treatment response. Although its underlying aetiology is unknown, there is a growing body of evidence supporting an immunological origin. Immunosuppressive drugs are used to treat EF and the corticosteroid is the first line treatment. A significant proportion of patients can develop permanent disabilities such as joint contractures, tendon retraction and subdermal sclerosis. Occasionally it can be treatment refractory or have a relapse-remitting course. We report another case of EF with a literature review. Platelets in Rheumatic Diseases: Friend or Foe?